Let's get the obvious joke out of the way. This scriptwriter is going places. I was in Hamlet in sixth grade. It was, of course, an abridged version. But it still had all of the greatest hits attached to it. I played Polonius. We also read it in Senior year. While this doesn't make me an expert on the play, I understood what was going on in the movie well enough. 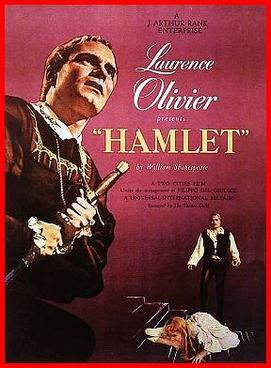 Before watching, I was very curious as to why Hamlet would win Best Picture. Was there going to be something new that Sir Laurence Olivier (I didn't ask him about a camera) would bring to cinema? Not that I could tell. Was there a new slant on the play? No. If anything, he cut it down to a more reasonable two and a half hours, but that doesn't scream Oscar. If anything, I thought a couple things were rather strange. The soundtrack didn't always match what was on screen. This was especially true in a few scenes that didn't have any soundtrack. And then there were a few shots that had me scratching my head. The one that stood out the most was a shot which pans up from Ophelia lying on the steps all the way up and out of the castle to the sky then returning down and into the back of Hamlet's head. I guess that answer as to why this won the Oscar is simple enough. It's a good story and it's well acted. Of the other movies nominated, the only one I know is The Treasure of the Sierra Madre. That's a really fun movie that I would have enjoyed watching again and writing about here.